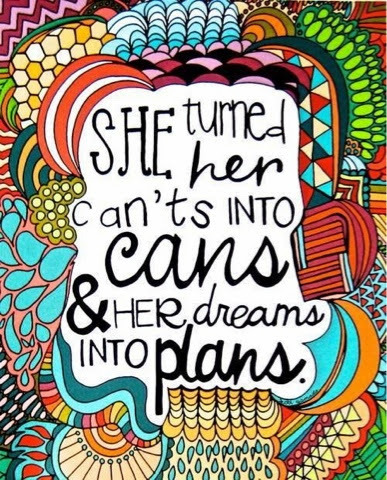 Motivational Monday #4 She turned her cant's into cans & her dreams into plans. When I was thinking about my future and what I wanted to do when I was older, it got put on hold. I decided after doing my GCSE's that I would return to education to do A-levels. I found this extremely difficult, as I felt that I wasn't getting the help I deserved, so I really struggled. I didn't do very well in Year 12 (first year of 6th form) after failing exam after exam after exam. not because I didn't try hard enough, because I did but because I just found A-levels too hard. After nearly not getting into my second year of A-levels, I thought 'what am I doing?' and after thinking about it, I decided to just carry on with A-levels even though I absolutely hated it. I came out of school with 2 A-levels in Drama and Theatre Studies and Ethics, which I felt really proud off. But you need 3 to get into university. I was really upset as all my school friends had got into their choice of university and I didn't even apply just because I knew I couldn't do it. I decided to take some time out and realised one day 'I want to go to university, I am going to go to university.' I went to college to do a 3rd A-level in English Language which made me realise that I wanted to do Journalism at university. I had to take two years out just to complete my English Language A-level, which wasn't ideal, but it made me realise what I wanted to do and what I had to do to achieve it. I eventually got my A-level and I am now at the University I want to be at, doing the course I want to do. :- IF AT FIRST YOU DON'T SUCCEED; TRY, TRY, TRY AGAIN. I have now completed my first year at university with a 2:1 and in September going to doing my second year.